AL Spring Training News and Position Battles: Down Goes Luzardo! Finally, baseball is here! There are games to talk about and there will be a whole lot more this time next week when the season truly opens up. This will be the final update when it comes to Spring Training position battles, but I’ll be sure to check back in when we get closer to the season. For the most part, the teams in the American League are just about set with their rosters. There are still a few battles left to be won over the final days of spring training and they may just carry on into the season. Of course injuries will happen and jobs will open up, which happens to be the case in Oakland. It breaks my heart to tell you Jesus Luzardo has been shut down for about six weeks due to a shoulder strain. He’s someone I’ve been tracking in my previous spring training position battles. 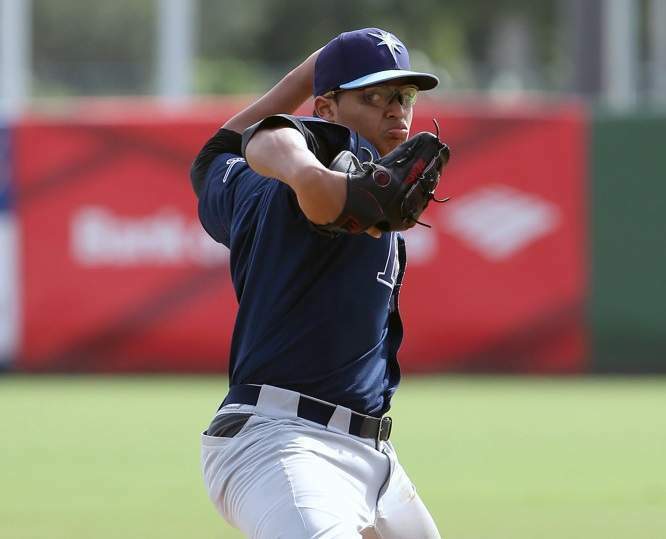 There happens to be another pitching prospect below who is starting to make some noise. This is Rio Ruiz’s last week to prove his worth at third for the Orioles. Ruiz has an impressive .275/.375/.500 slash line with two home runs, three doubles, six walks and a stolen base. Meanwhile, Nunez is only hitting .226 with 11 strikeouts over 21 at-bats. He’s also dealing with a minor arm injury, which means Baltimore will get another strong look at Ruiz. It’s Nunez who has the fantasy appeal, though, as he hit .275 with seven home runs in the second half last season. He also crushed 55 home runs from 2016 to 2017 in Triple-A. Matt Barnes has given up five runs on eight hits through four spring innings as he battles with Ryan Brasier for the closer role in Boston. He only has two career saves, but that’s two more than Ryan Brasier who has thrown all of one inning this spring. Brasier had a 1.60 ERA and 0.77 WHIP in 34 appearances last season. He was used in nine of Boston’s 14 postseason games and allowed just one run over 8.2 innings. Over his 33.2 regular season innings, Brasier had a low 7.75 K.9 but a solid 1.87 BB/9. It remains to be seen what Brasier can do over a full season. As for Barnes, he rocked a 14.01 K/9 over 61.2 innings, but he issued 4.52 BB/9. Christian Vazquez and Sandy Leon offer nothing offensively, but they are terrific defensive catchers. Vazquez is hitting .129 with a .290 OPS, but he caught Chris Sale’s first game this spring. Swihart is hitting .360 and has the highest ceiling of the trio. Boston carried three catchers last season, but they’ll only carry two in 2019. Leon could be the odd man out. Things have not worked out for Ervin Santana so far as he’s allowed four runs on eight hits over his first four innings with the White Sox. He’s doing better than Manny Banuelos, though, as he’s surrendered nine runs on 12 hits over 14 innings. Dylan Covey may just get the fifth spot in the rotation by default. In fact, it’s been a rough go for Lucas Giolito and Reynaldo Lopez as well: 45 hits, 28 ER, 7 HR & 15 BB over 24 combined innings. Santana should get a few more starts to showcase himself. Both pitchers have thrown 5.2 innings this spring and it’s Kelvin Herrera who has only allowed two hits to Colome’s eight. Both have experience as a closer and in a set up role. The Cleveland Indians don’t have much of an outfield, so newly signed Carlos Gonzalez should get an opportunity at an everyday role as soon as he gets his feet under him. He’ll likely start the season in Triple-A, but there’s an opt-out in his contract which allows him to pull out should Cleveland not call him up by April 20. With Leonys Martin locked into center and Jake Bauers in left – assuming Hanley Ramirez makes the team – Gonzalez figures to be the right fielder. Clearly, the Indians are not buying what Naquin is selling. Expect Greg Allen to be a speedy utility player for Cleveland. He has value in deeper formats. Michael Fulmer confirmed he’ll undergo Tommy John surgery which opens up a spot in Detroit’s rotation. Spencer Turnbull tossed five shutout innings Wednesday against the Philadelphia Phillies starting lineup. He struck out seven and only walked one. Turnbull has 15 punch-outs in 15 innings and is someone to keep an eye on. Daniel Norris has had plenty of opportunities in the past and has allowed six runs, four homers, and 14 hits over his 10.2 innings this spring. Forrest Whitley was sent down last week in a move we knew was coming. Have an eye on his status in the minors and expect a mid-summer call up as he makes for a solid stash option. In the meantime, Peacock deserves a spot in the rotation and he’ll likely get one. He has 10 strikeouts over 12 innings and he’s only given up two runs. Peacock made 61 appearances last season, but he only had one start. He does have experience as a starter, though, as he took the ball 21 times for Houston in 2017. In his 132 innings, he had a 10.98 K/9 and 3.00 ERA with a 13-2 record. Framber Valdez only has 37 big league innings on his resume and he had a respectable 2.19 ERA last season, but he walked 24 batters (5.84 BB/9). He’s given up six runs, five walks, and 15 hits over 13.1 innings this spring. Josh James is the forgotten one here as he’ll start the season in Houston’s pen. Don’t be surprised if he makes his way inside the rotation and you’ll want to have him when he does. The Royals haven’t named a closer, but Brad Boxberger seems like a good bet to win the job. Having said that, it’s been a rough spring as he’s allowed six runs over 3.2 innings. Willy Peralta has had a much better spring as he’s only given up four hits and one run on 7.1 innings. KC won’t get many save opportunities, so keep this battle on the back burner for now. Andrew Heaney won’t be ready to start the season so it looks like Felix Pena and Jaime Barria will get a bit more work inside the rotation. Pena has an impressive 16 strikeouts over 11.1 innings this spring. He had a 3.97 xFIP across 92.2 innings last season. Both will get a look until Heaney is ready and I’d imagine both will get plenty of innings due to the recent injury history inside the L.A. staff. You can officially scratch Jesus Luzardo’s name off the list as he’ll be shut down for 4-6 weeks due to a rotator cuff strain in his left shoulder. He’ll be re-evaluated then. Luzardo had 15 strikeouts over 9.2 innings and he has only allowed one earned run. Aaron Brooks will likely “earn” the final spot in the A’s rotation. I’m in the Teoscar Hernandez corner, although it seems like the Blue Jays want to use Billy McKinney most of the time in the leadoff spot. Hernandez has made a strong case this spring, though, as he has two home runs, six walks, and eight RBI. He’s hitting .410 with a 1.079 OPS. McKinney has two home runs and nine walks, but he’s only hitting .250 and has struck out eight times. McKinney is one of the few lefties Toronto has so it gives them a bit of balance when he’s in the lineup. Hopefully, you found Chris’ take on early position battles helpful? For more great fantasy baseball rankings, strategy, and analysis check out the 2019 FantraxHQ Fantasy Baseball Draft Kit. We’ll be adding more content from now right up until Opening Day! Chris Meaney is a contributor for FantraxHQ, covering fantasy football, baseball and hockey. Chris covered NHL, NBA, NFL and MLB as the producer, writer and host at FNTSY Sports Network. He was the lead host of the daily live shows, “Home Ice Advantage” and “Fantasy Sports Today.” Meaney has several years of radio and television experience both in the sports world and music industry. He’s written for The Athletic, Associated Press, New York Daily News, Fantasy Footballers, NBA Fantasy, Play Picks, NewCap Radio and more. You can follow him @chrismeaney.